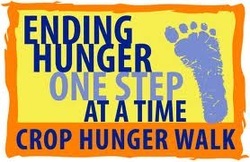 Crop Walk is the original walk to help end hunger. Each year more than 145,000 people gather in their communities to help end hunger. They do so by gathering contributions for the miles the will walk. Here at Everybody's Church we have a place to sign up to walk and then a place where people can make pledges for your efforts.